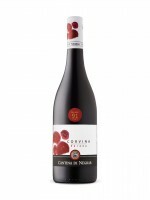 Corvina is the dominant grape used to produce Amarone and Valpolicella. It’s also increasingly being used to produce one-grape wines, like this light and juicy red from the Cantina di Negrar co-operative. Sweet cherry, peppery and floral notes add charm to this affordable red, which would pair nicely with meat lover’s pizza or spaghetti and meatballs.